If you’re moving to Cedar City, Utah from a location within 100 miles of Salt Lake City, or you’re moving from Cedar City, Utah to a location within 100 miles of Salt Lake City, then give us a call at Moving Connections 801.532.6683. Moving Connections has been providing Utah customers with top notch moving services for more than thirty years. Our moving crews are selected from experienced professionals. And Moving Connections is federally licensed, bonded, and insured. Moving Connections, winner of many 'top rated mover' and 'best rated mover' awards since our beginning in 1981. Movers.com has awarded Moving Connections with their coveted "Trusted Seal"
Moving Connections parent company has been selected 'Best Of Business' for 2018 by the Small Business Community Association. If Moving Connections is moving you to Cedar City it's a perfect time to begin to utilize the many resources and bounties of Cedar City. For example click on the picture to the left to go the Moving Connections 'Support - Advice - Assistance' page and discover Cedar City for the first time. Once you are on the 'Support - Advice - Assistance' page go ahead and open the .pdf link found there and tape the list of emergency and useful phone numbers on your refrigerator. 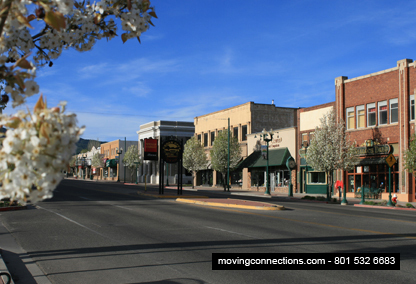 Moving Connections has gone to great pains to find those links and connections to integrate you quickly into Cedar City life. We are Moving Connections, a federally licensed, bonded, and insured professional moving company based in Utah. We have been in business for more than thirty years providing moving, shipping, and freight forwarding services to Utah residents. We even provide a full complement of moving services including crating and shipping of fragile items, home staging, and storage space, both climate controlled and conventional. We at Moving Connections even offer “handyman” repair services and thermal imaging services to detect and repair thermal leaks in your home. Sorry, we cannot provide “Labor Only” service to the Cedar City, Utah area. If you’re planning an office or corporate move from Cedar City, Utah to the Salt Lake City area (100 mile radius) or vice versa, Moving Connections stands ready to assist you. We have been in business for more than three decades helping Utah families, individuals, and businesses to make a smooth transition to their new quarters. So we know how to serve Utah businesses. Moving Connections is federally licensed, and we are also bonded and insured according to federal requirements. So we are professionals. But what really sets us apart from many other moving companies is our moving teams. We field the best moving crews in the Intermountain Region. The reason for this is that we hire only experienced moving men for our crews. So there’s no wasted motion or time when they get to work.